PALMVIEW, Texas (CBS/AP) President Barack Obama's approval rating may be hovering in the 50 percent range, but that doesn't mean America's Commander-in-Chief isn't catching on with new constituents. 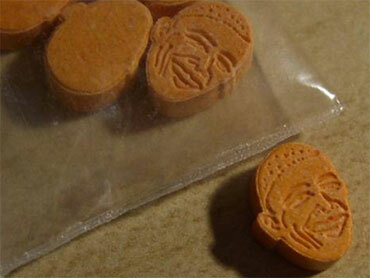 There is now a line of Ecstasy pills made in the image of the 44th president of the United States, according to Texas police who have snatched a batch off the streets. Ecstasy is known for a sense of elation, diminished feelings of fear and anxiety, and ability to induce a sense of intimacy with others. Perhaps a good Election Day strategy to get out the vote? A stash of the brightly colored tablets was found Monday during a south Texas traffic stop. Police in Palmview detained a driver after finding black tar heroin, cocaine, marijuana and several Ecstasy pills in the back of his car. The drugs look like a "vitamin for kids," police spokesman Lenny Sanchez said. Police say that other Ecstasy pills they found were made to look like the cartoon characters Homer Simpson and the Smurfs. The 22-year-old driver is expected to face felony drug possession counts. Palmview is near the border with Mexico. No word on the driver's political affiliation.